I’m currently 35,000 feet in the air headed to Baltimore, MD for what should be a fun, stress-free Thanksgiving vacation with C, his parents, my mom and C’s sweet friends. But before I boarded this plane, there was some serious planning/packing happening (and cookie baking as well!). I am notorious for over packing. I’m also notorious for forgetting something. Funny how that works. A typical packing session for me involves taking half of my closet and attempting to stuff it all in a carry-on suitcase. I have commitment issues. I never know what I’m going to feel like wearing and I hate being bound to a strict outfit schedule. I just end up bringing four options per day which adds up to a lot of clothes. But this time, I resolved to make a change. I was inspired by the tips I read here. I will be re-wearing the same jeans and boots throughout the week and I’m sticking to a somewhat consistent color palate. I’m also bringing my favorite necklace and two scarves to help change up the outfits. Scarves are easy to pack and a great option to pull and outfit together. Madewell and Zara make some great ones. So, I turned to my trusty friend Excel for some organizational help. I made a snapshot of the week we’ll be in Maryland. I then outlined each day, considered what I thought we would be doing, and chose an outfit. One outfit. That’s it. I included a workout outfit and something to sleep in as well. I picked three (count ‘em, just three) pairs of shoes (including running shoes). You say OCD, I say organized. 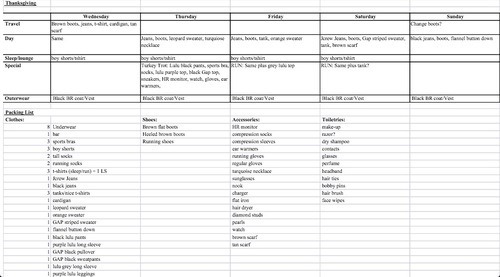 This should mitigate any chances of me forgetting something (just check it off the list) and it should also make for easy dressing each day. There is always the chance that I won’t have packed just the right sweater or shoes but that’s just a chance I’m going to have to take. Living on the edge, I know. My beloved carry-on had a small tear repaired yesterday and was in perfect condition to be loaded up with all my goods. I had every intention of taking pictures of my packing process to post but in an effort to finish baking six dozen cookies before midnight, it didn't happen. But the spreadsheet was flawless! It made packing a snap and I'm confident that I didn't forget anything! I'll chalk that up to a win in my book. Do you have any packing tricks or tips?